B. R. Lakin was born on a farm near Fort Gay, West Virginia. Although his parents were devout Christians, it was not until he was sixteen that he was converted to Christ during a revival meeting. The minister who baptized him was the nephew of Devil Anse Hatfield of the Hatfield-McCoy feud families. One week later he preached his first sermon and soon after became a circuit preaching riding a mule to country churches near the forks of the Big Sandy River. After attending Moody Bible Institute and pastoring several churches, he was called to assist E. Howard Cadle at the Cadle Tabernacle in Indianapolis, Indiana. Upon Mr. Cadle’s death, Lakin became pastor and during the next fourteen years the ministry grew until he was preaching to ten thousand people each Sunday in addition to broadcasting the services nationwide. He was given honorary doctorates by Bob Jones University and Kletzing College. 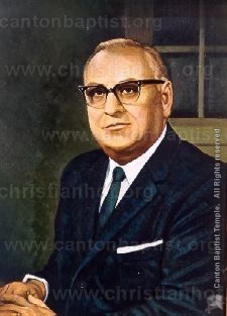 After more than sixty-five years of preaching, Dr. Lakin “hung his sword on the summery walls of the city of God” and went to be with the Lord on March 15, 1984. His funeral was conducted at the Thomas Road Baptist Church in Lynchburg, Virginia and was attended by more than five thousand people.